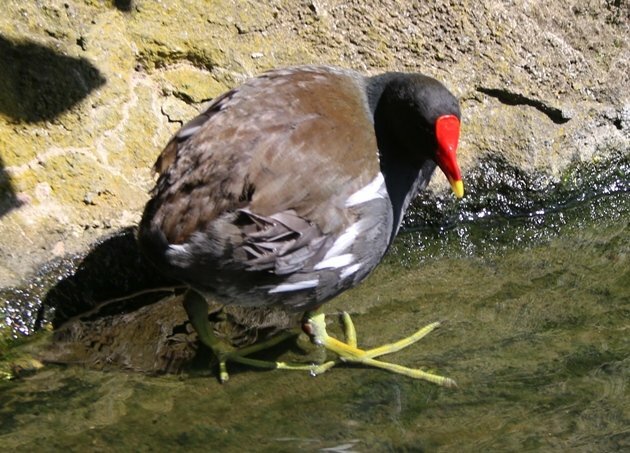 The Common Moorhen still is in Germany what its name implies: common. Well, it is rather common and can even be scarce regionally, but overall it is not a difficult bird to find in Germany so long as a cunning birder frequents reedy wetlands. However, those populations in natural habitats take their rallid heritage quite seriously and are far more often heard than seen. 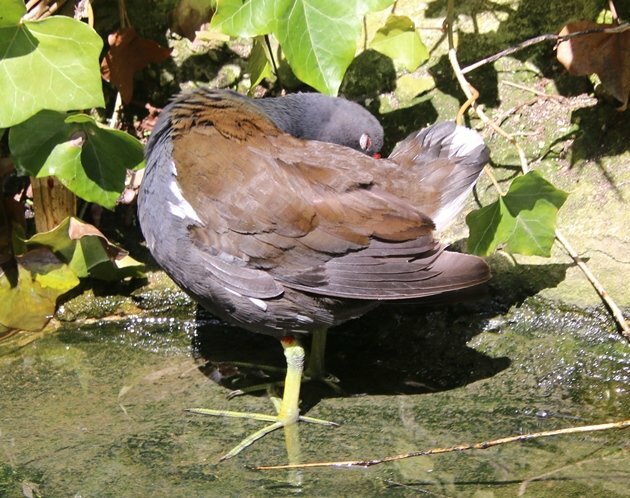 Birders – cunning or not – therefore will likely have to spend quite some time waiting and scanning the edges of reeds to not miss the few seconds a Common Moorhen needs to emerge from the reeds, get startled by the fact that it has emerged from the reeds, and immerge back into the reeds. 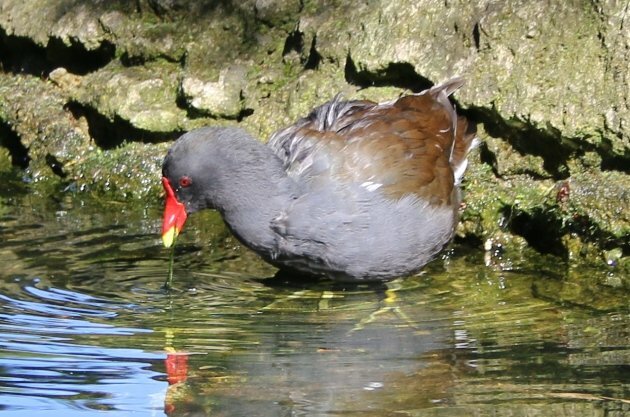 However, there is more to the Common Moorhens than a broad reed bed: the city dwellers, the moorhens that aren’t really moorhens in a rallid sense. 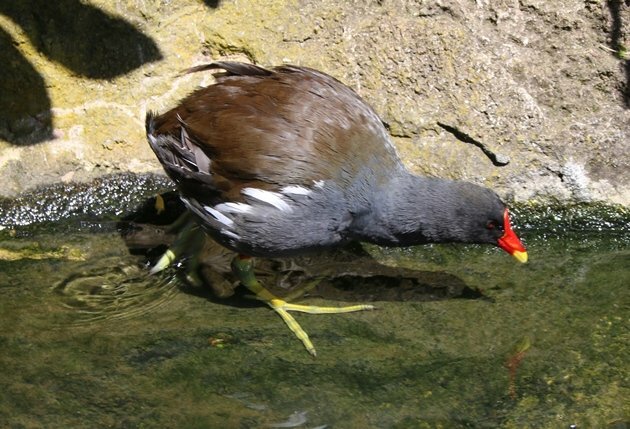 Intriguingly, Common Moorhens are also rather common in Germany’s large ornamental city parks and zoos. 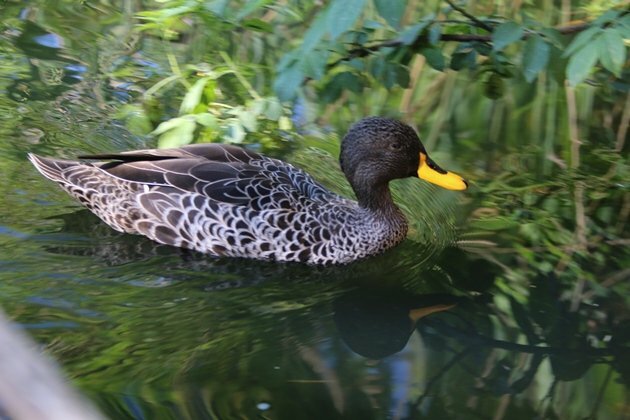 At these places they are neither shy nor reed-dependent but can often be seen grazing on lawns like cows or swimming on open ponds no less visible than a rubber duck in a bath tub. 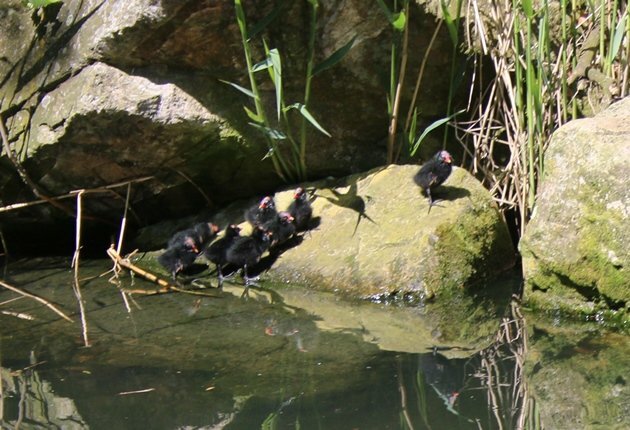 It may take a bit of training to obtain a mindset strong and focussed enough to blend out the surroundings, but once that is achieved, watching Common Moorhens at these artificial locations is a pure treat since you can get close and can watch them do many different things that have nothing to do with getting startled at having emerged from reeds. 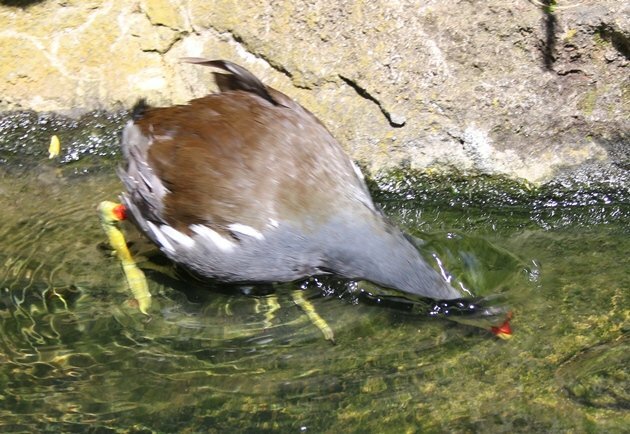 I am not referring to the one incident when two Carrion Crows at Basel Zoo suddenly descended on a grazing Common Moorhen and ripped it apart for no apparent other reason than joyful play. Since then, I have maintained full understanding of their penchant for reeds. No, the usual birding opportunity at zoos and parks is one of watching feeding and preening behaviour, or parenting and social interactions. The following pictures were taken at Hannover Zoo recently, showing just that – feeding and preening, for a family-friendly birding experience. 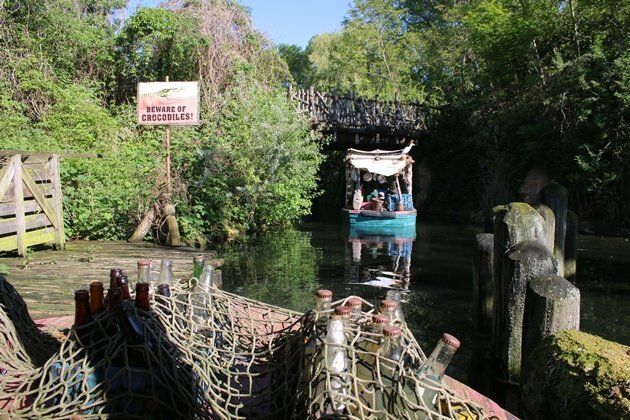 The “Zambezi River” boat tour takes you through the heart of darkness Common Moorhen terrain at Hannover Zoo. Beware of Crocodiles. 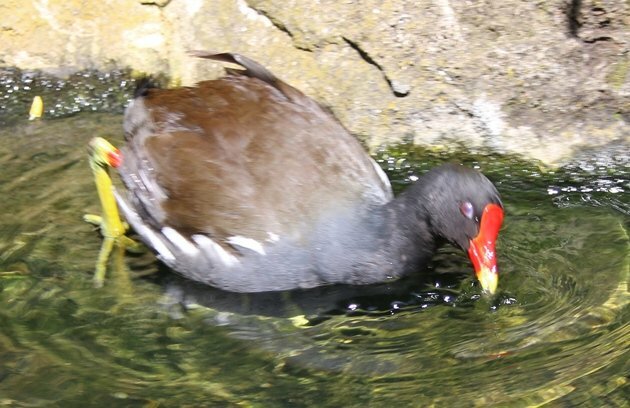 Since their split, the rounded red shield on the forehead is what separates the Euro moorhen from the American Version most reliably. … algea. I may be wrong, but last time I gave it some thought I had the impression that algea aren’t particularly fast, shy and flighty creatures which require stealth and speed to catch. 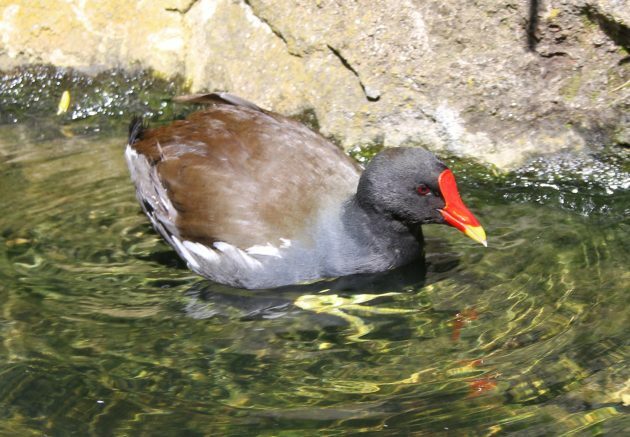 But hey, I ain’t no moorhen, so what do I know? Fun detail: nicticating membrane protects the eye from damage by algea that can fight back verociously in their death struggle.